After hours of research, ordering microfilm and perhaps even traveling to your ancestor's hometown, you finally have your hands on those coveted genealogical documents. But one glance at them leaves you more confused than ever before. As anyone who has braved the world of German genealogy knows, the German handwriting of the past is very different from handwriting today. This can often mean that your ancestors' stories remain in the dark. But it doesn't have to be so. 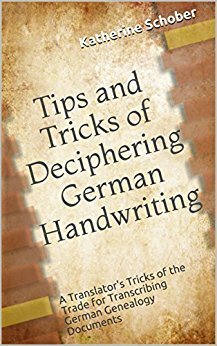 In this presentation, learn from a professional German handwriting translator - who works with the old script on a daily basis - how you can overcome the obstacle of old German handwriting and find the answers you so ardently seek. Learn to identify letters by their distinctive features, to understand what those obscure abbreviations mean, and how to use technology to fill in your missing blanks. With these tips, tricks, and technological methods, you will be well on your way to discovering the stories of the past.